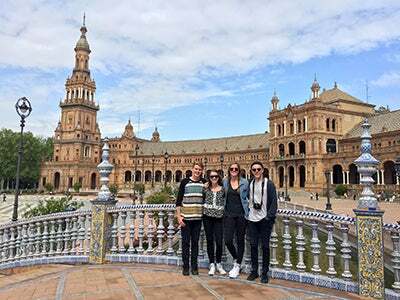 Undergraduate student Griffin Carlborg blogs about studying abroad at NYU Madrid. I can truly say, after my time away, a change in perspective has made a positive change in my life. I am comfortable in uncertain situations. I feel a new source of energy. I feel inspired to collaborate. My time in Spain has ended. I am back home in sunny Southern California, and these first few sleepless nights fighting the jet lag have given me a lot of time to reflect on my semester in Madrid. The last word to describe my time away is perspectiva…. Perspectiva is perspective, and mine really changed while studying in Spain. I tried new things, had an open mind and met new people. I learned a new language, made friends that span from Bilbao to Iowa, completed an entire semester of liberal arts courses in my second language and traveled to five countries. I can truly say, after my time away, a change in perspective has made a positive change in my life. I am comfortable in uncertain situations. I feel a new source of energy. I feel inspired to collaborate. I feel ready to return to Stern! The semester is flying by. 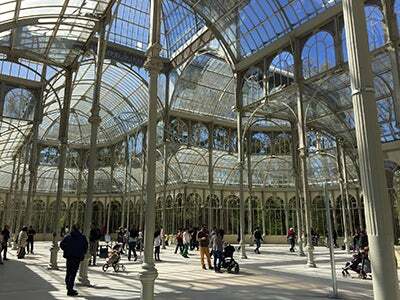 The students at NYU Madrid have conquered midterms, traveled around the world for spring break, learned a new language and are currently soaking up the beautiful spring sun. Primavera means spring, and I am certain every student at NYU Madrid has been awaiting the arrival of this amazing season. Though the winter in Madrid was nothing like what everyone endured back in New York, spring gave us the opportunity to finish up our midterms and start our travels for Spring Break. I did something different and traveled around Europe primarily by myself. 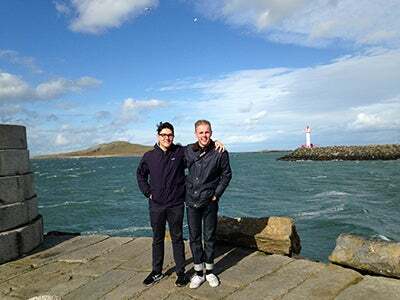 My break began in Dublin, Ireland with my buddy Jack who visited me from New York. Ireland was all about the people. The locals were warm and inviting, and it was such a relief to be back in an English-speaking country. I had forgotten what it was like to have a conversation without navigating the vocabulary, grammar and accent of a second language. 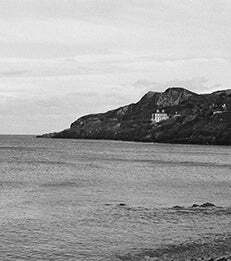 We had a killer time getting lost on the coast of Howth, meeting locals and catching up with each other. Jack said goodbye, and I made my way to London. At this point, I was completely on my own. 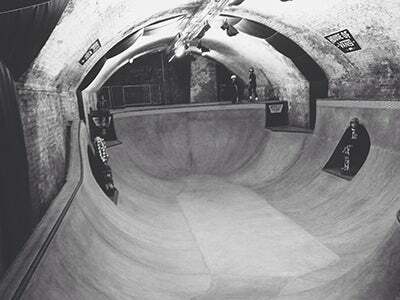 The first thing I did upon my arrival in London was visit a skate park built in an abandoned train tunnel. I spent the afternoon with a group of nine- and ten-year-olds that made me feel like a beginner. Those kids can skate! Later, I made my way over to NYU London to catch up with the familiar faces in the BPE program that I had not seen in quite some time. I loved exploring another NYU campus and hearing about the experiences my friends were having in a completely different country. My break ended at a fourth NYU campus: Paris! Paris is a city that I have wanted to explore since I was little, and it was surreal to finally be there. Paris is on another level. The locals are so sartorial. The food is delicious, and the art and architecture are like nothing I have seen. I filled my days visiting Notre Dame, the Arc de Triomphe, the Eiffel Tower, the Louis Vuitton Foundation and the Louvre as well as catching up with friends. I had the break that I need to recharge the batteries and return to Madrid inspired and refreshed. Familia is family, and mine arrived in Madrid right when I returned from my break. 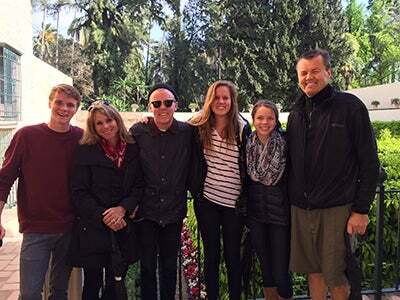 All four Carlborg kids were reunited, and we spent the week exploring Madrid and the rest of Spain with our parents. We had delicious food, traveled to the south of Spain to visit Seville and were able to catch up in person about all that we have been doing. The best part about having a big family is there is so much to talk about! Dinners last hours, and the jokes and fun never stop. We did not have a silent moment on the trains or during the car rides. It was one of the best weekends I have had in Spain, and I was very lucky to share my abroad experience with my entire family. Idioma means language. This past month, I have truly noticed the change that studying abroad has brought to my Spanish. It has been so surprising to walk into restaurants and think in Spanish, or run into Spanish friends on the street and immediately jump into conversation in my second language. The progression has been very natural. I am having so much fun that I have not necessarily noticed how much the exposure to the language has helped. 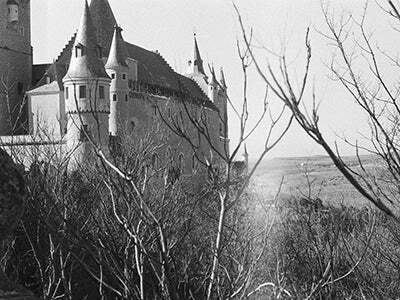 Frequently, I find myself dreaming and thinking in the language. It is incredibly fun to look back and notice the progression that has happened over these past few months! I cannot believe there is only one month left! Hola! I can’t believe a month has gone by since last writing. I have made new friends, learned more Spanish, conquered midterms and, as cheesy as it sounds, grown as an individual. Gente are people, and discovering a new place is all about the people. People give so much insight into a country, and, when you have the opportunity to share stories and experiences with local people, the experience is so fulfilling. Locals in Madrid are warm, exciting and engaging. 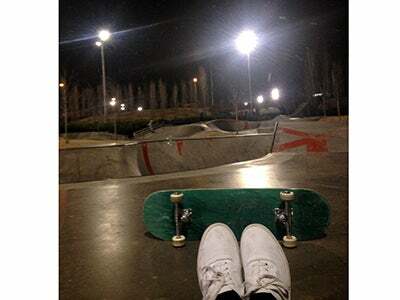 I have been lucky enough to make two local friends at the skate park down the street from my house, which has completely changed how I am experiencing Spain. They include me in conversations with their friends and invite me to tag along when they plan to go for a skate. Hearing how they talk about living in Madrid and seeing what they do differently has given me a lot of insight into what it is like to actually live and work in Madrid. I am grateful for these two local friends because they have genuinely changed how I will remember my experience in Spain. In addition, I have had some amazing experiences with my fellow NYU peers. 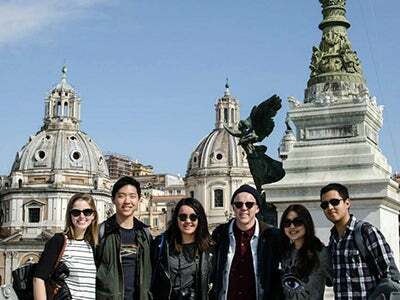 Earlier this month, I spent the weekend in Rome with some friends studying at NYU Florence and a few fellow Sternies, and it was truly the people on the trip that made it so memorable. As we looked at beautiful art and historical monuments, we were able to talk about our experiences and goals. Sharing that moment with NYU students made it that much more special. Cultura is culture, and, with each week that passes in Spain, I feel more and more immersed in the culture and Spanish way of living. 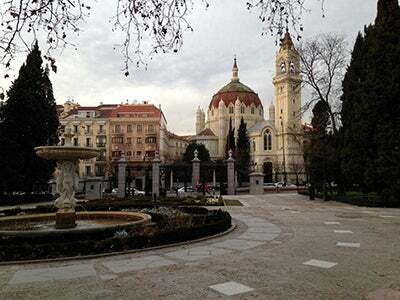 After traveling to Rome, I was able to travel to The Basque Country and Toledo with NYU. 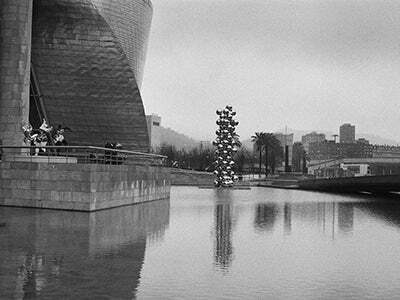 In The Basque Country, I visited the Guggenheim, Guernica, local fishing villages and cathedrals. 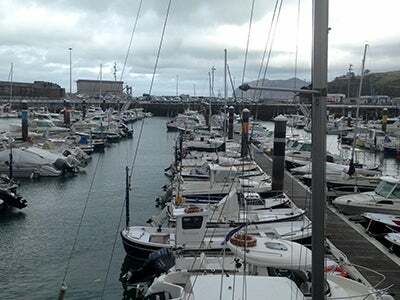 However, the culture of The Basque Country is what made it so memorable. Before the trip, I continued to hear about how unique Basque culture is, and it was something I had to experience to understand. Our tour guide for the weekend was an NYU graduate student from Bilbao, a city in The Basque Country. As soon as the tour began, it was apparent what everyone had been talking about. She showed us how The Basque Country was different from the rest of Spain, and she was so passionate, open minded, driven and bold. Her energy encouraged me to dive further into the culture. Each night in Bilbao, I would explore the city with my friends and go out for pinchos at different bars around the city. Pinchos are snack-sized portions of traditional Basque food and, in my opinion, was the best way to immerse myself in the culture. The entire city gathered in the streets of downtown eating pinchos. After, overhearing countless conversations, watching locals interact with one another and experiencing a typical Basque night it was apparent that The Basque Country is a culture built on passion and energy. Fútbol is the Spanish word for soccer. I have never seen a city rally around a sports team like Madrid does for Real Madrid. Regardless of where you go, it is easy to spot a Real Madrid jersey on countless people, and, surrounding the city center, there seem to be more Real Madrid stores than there are pharmacies. When you are near the stadium on game day and Real Madrid scores, you can hear the explosion of cheers from a mile up the street. However, nothing would compare to the experience of actually seeing them play. 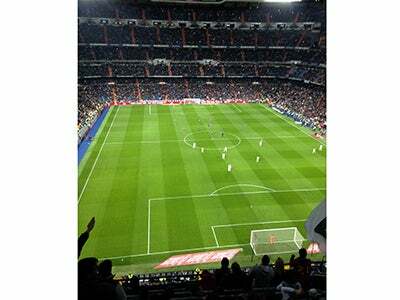 This past week, I had the opportunity to watch Real Madrid play against Levante. Sections of the stadium were on there feet screaming during the entire game, and, regardless of whether Madrid scored or missed, the entire stadium was cheering in support. I have never seen a city back a single sport and a single team so heavily. Real Madrid seems to be a source of pride and energy for the entire city. It is the experiences that continue to make my time abroad so memorable. I look forward to meeting more interesting people, exploring new cities and immersing myself in culture around Europe. 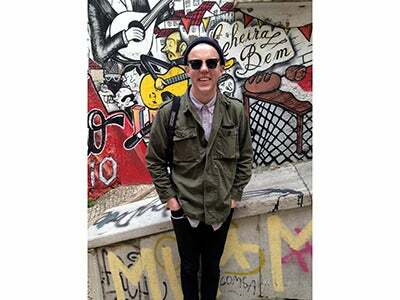 My name is Griffin Carlborg, and I am a sophomore studying marketing with a minor in Spanish. 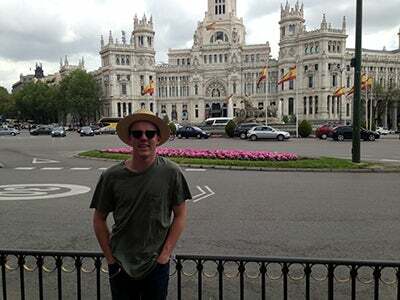 I am studying at NYU Madrid this semester to fully immerse myself in the Spanish language and culture. 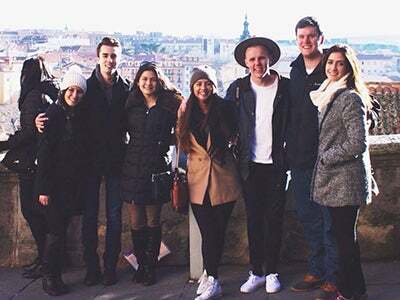 Amigos are friends, and studying abroad has introduced me to a completely new group of people. I am studying with students from not only from NYU New York, but also from NYU Abu Dhabi, Cornell, Vanderbilt, Union College and USC. However, the most exciting part has been becoming amigos with students who are not studying at NYU Madrid. I go to the skate park a few times every week and have a crew of Spanish guys whom I meet up with regularly to skate and practice Spanish. In addition, I traveled to Portugal and grew close with a group of 30 guys from the Royal Veterinary College Crew Team, based in London. It has been amazing to collaborate and learn from people around the world. 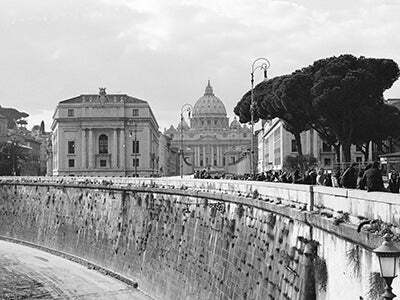 Viaje means trip or voyage. 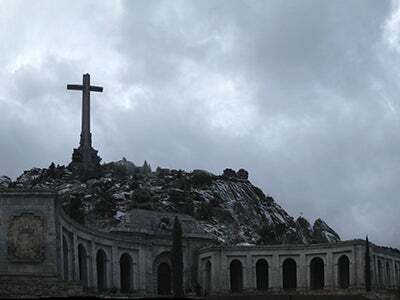 Traveling to Madrid was my initial viaje; however, since then I have had the opportunity to travel to Segovia, El Escorial (the historical residence of the King of Spain), Valle de los Caídos (the burial site of Francisco Franco), and Lisbon, Portugal. Every viaje has been amazing and has opened my eyes not only to new beautiful places, but also to so much of the history surrounding Europe. It is amazing to interact with locals, and, as a tourist, I am extremely curious and am completely surprised by what I find every day. 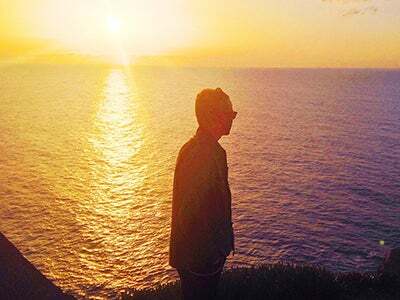 In Portugal, I traveled to Sintra on a whim and found myself watching the sunset from the westernmost point in Europe. It was an unexpected and incredibly beautiful moment. Bicicleta is a bicycle. At first, this word might seem a bit random to blog about, but I promise it is relevant. 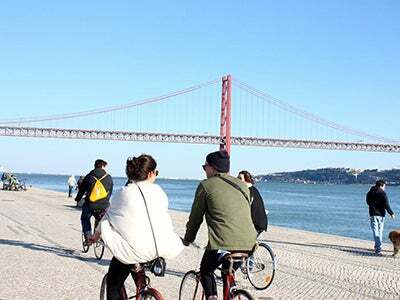 While in Lisbon, Portugal I rented a bicicleta and spent the day riding along the waterfront. As I was riding, I was continuously pedaling and continuously moving forward. My trip has been the exact same way. If I wake up in the morning and I pedal (work hard and explore); I move forward. So, every day, I try to do something different. 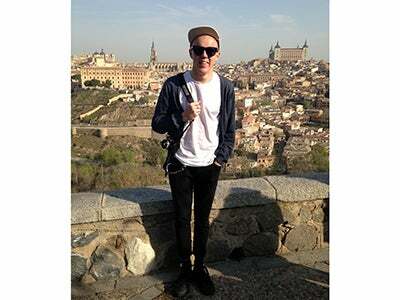 I work hard to meet new people, explore parts of Spain, and to push myself in my studies. It is not always easy to wake up and want to speak Spanish. Sometimes it is a little embarrassing to sound like a fourth-grader because my Spanish vocabulary is still growing. However, when I push myself, it is so rewarding. It only takes one conversation with a native to build upon my vocabulary, and, when I pedal, I move forward. Inmersión is immersion. NYU Madrid is truly an inmersión. In fact, my entire course load is in Spanish, which has been crazy. I am taking classes about literature, translation, art history and cinema. I love it! The learning does not stop when I leave the classroom. I am immersed everywhere I go. When I go to the butcher, I have to order everything in Spanish, and, this morning, I got a haircut and slowly tried to explain how I liked to style my hair in Spanish. It was scary because I was afraid the barber would chop everything off, but it turned out great! Inmersión is easily the best part about studying at NYU Madrid. It makes my day exciting, and it keeps me guessing about what will happen tomorrow.